First version: July 26, 2018. These Terms & Conditions refers to the GroLab Starter Kit Giveaway Instagram Contest, which starts on July 26, 2018 and ends on August 26, 2018 at 23:59 (UTC +1), this contest will be referred to as GIVEAWAY CONTEST throughout this document. We try to provide all the information regarding this contest clear as possible, so that you can easily understand how to participate, what is the prize, how will we pick the winner, as well as all the contest rules and conditions. It is very important for us that this contest match your expectations, so please take a few minutes and fully read this document. Please note that it is necessary to accept these Terms and Conditions in order to participate. This contest is being promoted by Open Grow, Lda, with head offices at Rua Mário Pais da Costa, nº12 – 3515-174 Abraveses, Viseu, Portugal, registered at the Conservatória do Registo Comercial de Viseu under the single number of registration and of legal person 513 181 547, with the share capital of € 50,000. To shorten and simplify, the company described above, Open Grow, Lda, will be referred to as OPEN GROW throughout this document. These Terms and Conditions apply to the participants of the GIVEAWAY CONTEST and are deemed to be in force, with no expiration date, and until their revision or revocation. The GIVEAWAY CONTEST is exclusive to the Instagram social network. There is no entry fee and no purchase necessary to enter the GIVEAWAY CONTEST. By entering this contest, an entrant is indicating his/her agreement to be bound by these Terms and Conditions. Entry into the contest will be deemed as acceptance of these Terms and Conditions. Route to entry for this contest and details of how to enter are via: instagram.com/opengrow/, where you can find the photo regarding this contest. OPEN GROW’s decision in respect of all matters to do with the contest will be final and no correspondence will be entered into. OPEN GROW is not responsible for inaccurate prize details supplied to any entrant by any third party connected with this contest. The participant compromises to use Instagram as well as OPEN GROW’s websites and services in compliance with the provisions of applicable law, refraining from using the websites/services for activities contrary to law, morality and good manners, or rights and interests of third parties. You are responsible for the type of hardware and software required to access these websites and services. The GIVEAWAY CONTEST is open to everyone aged 18 years or over, except employee of OPEN GROW and their close relatives and anyone otherwise connected with the organization of the contest. Participants should use their Instagram’s personal account. Instagram’s business accounts are not allowed. It is strongly recommend that your Instagram profile visibility is set to public, to make it easier to validate you followed all the required steps to participate. If you want to participate with the profile visibility set to private, it is required that you send a direct message (DM) to OPEN GROW’s Instagram account in order to arrange a way to validate your participation in the contest. Closing date for entry will be August 26, 2018 at 23:59 (UTC +1). After this date the no further entries to the contest will be permitted. 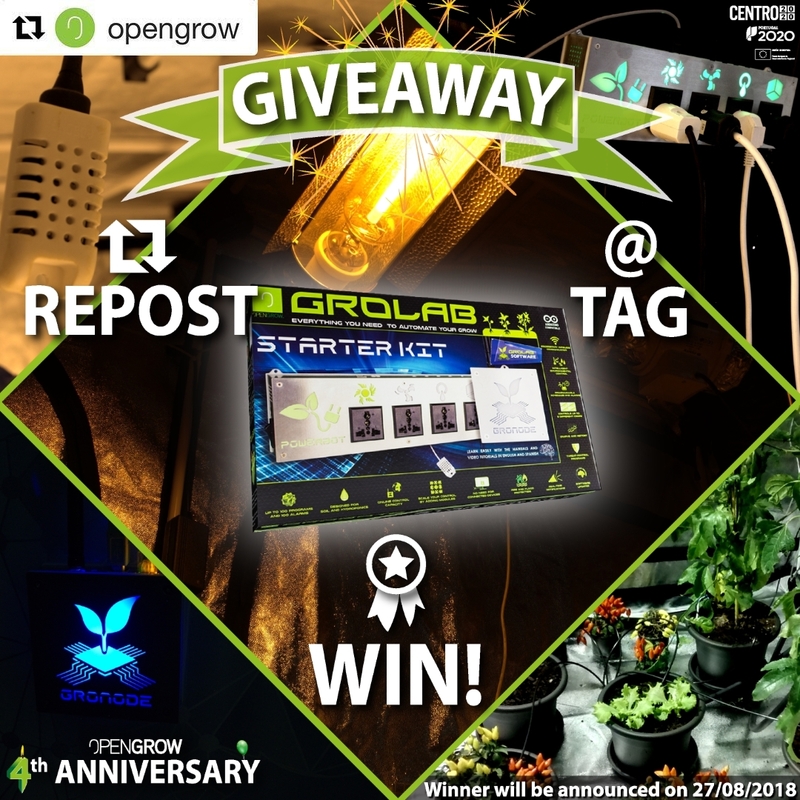 This contest’s main prize is one GroLab™ Starter Kit, all the information about this product is available at OPEN GROW’s online store on the following link. The prize is as stated and no cash or other alternatives will be offered. The prize is not transferable. Prize are subject to availability and OPEN GROW reserves the right to substitute any prize with another of equivalent value without giving notice. OPEN GROW also offers free shipping for the contest’s prize for European Union countries. However, if the contest’s winner wants to receive the prize outside European Union, the shipping, customs expenses as well as other associated extra costs should be handled by contest’s winner. There are also a secondary prize for the first ten participants, this prize is a 30% discount coupon on any GroLab™ Kit or GroLab™ Module that can be used on OPEN GROW online store. These coupons are valid until August 31, 2018. 3 – Follow OPEN GROW’s Instagram profile. For the main contest’s prize (one GroLab™ Starter Kit), on August 27, 2018, OPEN GROW will validate all contest entries and will assign a random number to each valid entry. Then the winner’s number will be randomly chosen. In order to achieve a fair randomization, OPEN GROW will use the random.org website services. The winner’s selection will be showed on a Instagram live session on August 27, 2018 at 18:00 (UTC +1), later a video showing the selection will also be provided on OPEN GROW’s Instragram profile. For the secondary contest’s prize (30% discount coupon on any GroLab™ Kit or GroLab™ Module), the coupon will be sent through Instagram by direct message (DM) to the first ten participants with a valid contest entry. The coupon will be sent up to 48 hours after the entry of the participant. After picking the contest winner, the winner will be notified by a direct message (DM) on Instagram within 3 days of the winner’s selection date. If the winner cannot be contacted or do not claim the prize within 5 days of notification, we reserve the right to withdraw the prize from the winner and pick a replacement winner. If a replacement winner is required, these Terms and Conditions will still apply to the new winner’s selection as well as the prize claim. OPEN GROW will also notify the winner when and where the prize can be collected/is delivered. – Do not use false identities. If any of the data is incorrect or incomplete, and therefore there is a delay or impossibility in the processing of the delivery, or any non-delivery, the responsibility belongs to the contest’s winner, and OPEN GROW refuses any responsibility. If you breach any of these obligations, OPEN GROW reserves the right to refuse future contents entry, to block access to the Open Grow Shop, to cancel the provision of any other services simultaneously provided by OPEN GROW to the same person; and also does not allow your future access to any or any of the services provided by OPEN GROW. In the event that the contest’s winner disrespects these duties, as well as any other violation of these Terms and Conditions, OPEN GROW will pick a replacement winner. In this case, these Terms and Conditions will still apply to the new winner’s selection as well as the prize claim. OPEN GROW reserves the right to suspend, cancel or amend this contest and these Terms and Conditions without notice in the event of a catastrophe, war, civil or military disturbance, act of God or any actual or anticipated breach of any applicable law or regulation or any other event outside of the OPEN GROW’s control. Any changes to the contest will be notified to entrants as soon as possible by OPEN GROW. The GIVEAWAY CONTEST and these Terms and Conditions will be governed by Portuguese law and any disputes will be subject to the exclusive jurisdiction of the courts of Portugal. This contest is in no way sponsored, endorsed or administered by, or associated with, Instagram, Facebook, Twitter or any other Social Network. You are providing your information to OPEN GROW and not to any other third party. The information provided will be used in conjunction with these Terms and Conditions. OPEN GROW respects the privacy of all users of its contests, websites and online services. In this way, OPEN GROW is committed to ensure the protection of all personal data provided by users. All the GIVEAWAY CONTEST entrants agrees to the use of his/her Instagram’s profile name for the winner’s selection process, this way this name will also be visible on the video recording of the winner’s selection process that will be posted on OPEN GROW’s Instragram profile. This video recording will be deleted after thirty days from the moment it was posted. The winner agrees to the use of his/her Instagram’s profile name and picture in any publicity material, as well as their entry. Any personal data relating to the winner or any other entrants will be used solely in accordance with the General Data Protection Regulation – in order to ensure the confidentiality and security of personal data provided. These data will not be disclosed to a third party without the entrant’s prior consent. OPEN GROW reserves the right to change and update the personal data protection procedures without prior notice. Despite the aforementioned protection procedures, there are risks of using the Internet, over which OPEN GROW has no control. Regarding the customer data management, the personal data collected will be transmitted to third parties, like freight carriers, having as sole and exclusive purpose the realization and complete execution of the product delivery to the contest winner. In accordance with Regulation (EU) No 524/2013 of the European Parliament and of the Council of 21 May 2013 may use the ODR – RLL platform in Portuguese. You can consult the list of ADR (Alternative Dispute Resolution Authority) in the following link. In no event shall OPEN GROW, its officers, directors, employees or representatives be liable for any direct, indirect, incidental, special, punitive or unforeseeable damages resulting from any (I) errors, misconceptions or inaccuracies in content, (II) personal injury (III) any access or use of our protected servers and/or any and all personal and/or financial information stored that has not been authorized, (IV) any bug, virus, trojan horse or the like that may be transmitted to or through our websites/services by any third party, and (V) any interruption or cessation of transmission to or from our websites/services; or (VI) any errors or omissions in any content or any loss or damage of any nature suffered as a result of the use of any content or e-mail sent, transmitted or otherwise made available through our websites/services, whether by liability, contract, offense or any other legal hypothesis, and regardless of whether the company is advised of the possibility of such damages. The limitation of liability described above shall be applied to the maximum extent permitted by law in the competent jurisdiction. You specifically acknowledge that OPEN GROW shall not be liable for any defamatory, offensive or unlawful content or conduct of any third party and that the risk of injury or damage resulting therefrom lies entirely with you.